Dishwashers can get pretty filthy if not cleaned out properly, and on a regular basis. There is a certain irony that an appliance used to clean can get so dirty, but irony does nothing to mitigate a problem. Fortunately, there is a relatively easy way to clean your dishwasher, and to keep it sparkling, so it can do its job properly. The following are some handy tips you might want to put to the test. Having a dirty dishwasher filter translates into not so clean dishes. A filter is the perfect grime catcher. The filter, usually at the bottom of the inside, can be unscrewed and soaked in warm, soapy water. Leave it for about 10-15 minutes. If there’s food gunk still hanging around, gently scrub it off with a toothbrush or other small brush. The filter is fragile, so be mindful when cleaning it. Once you’re happy with how it looks, put it back in its spot. A clean smelling dishwasher means clean smelling dishes. Vinegar is great for deodorizing and making things smell fresh. Pour a cup of white vinegar into the bottom of an empty dishwasher. Turn the machine on a heavy cycle and let it run through. Your dishwasher should look and smell brand new afterwards. Baking soda is a terrific cleaner. For an extra clean smelling dishwasher, sprinkle about a cup of baking soda into the bottom of the appliance and let it be overnight. Run a cycle on empty in the morning and you’ll see and smell a big difference. If after all that you still spot a few less than sparking spots, perhaps around the seal or in various crannies, use a new toothbrush to reach those tight spots where extra debris could be hiding. Scrub using soap and water, or make a paste out of baking soda and water. This is sure to get all those hard-to-reach spots gleaming in no time. Baking soda and vinegar are just two things that will do a great job cleaning your dishwasher. Borax is also highly recommended, as is using some bleach if you spot any mold in your machine. Mold is really hard to combat, but bleach seems to do the trick. 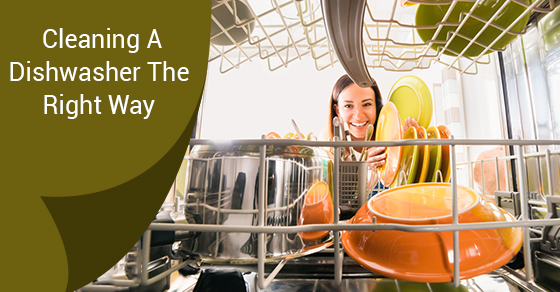 Keeping your dishwasher clean is the best way to combat gunk and odour. After all, you don’t want the machine that cleans your dirty dishes to be nastier than the dishes they’re cleaning. Can House Cleaning Reduce Illness?